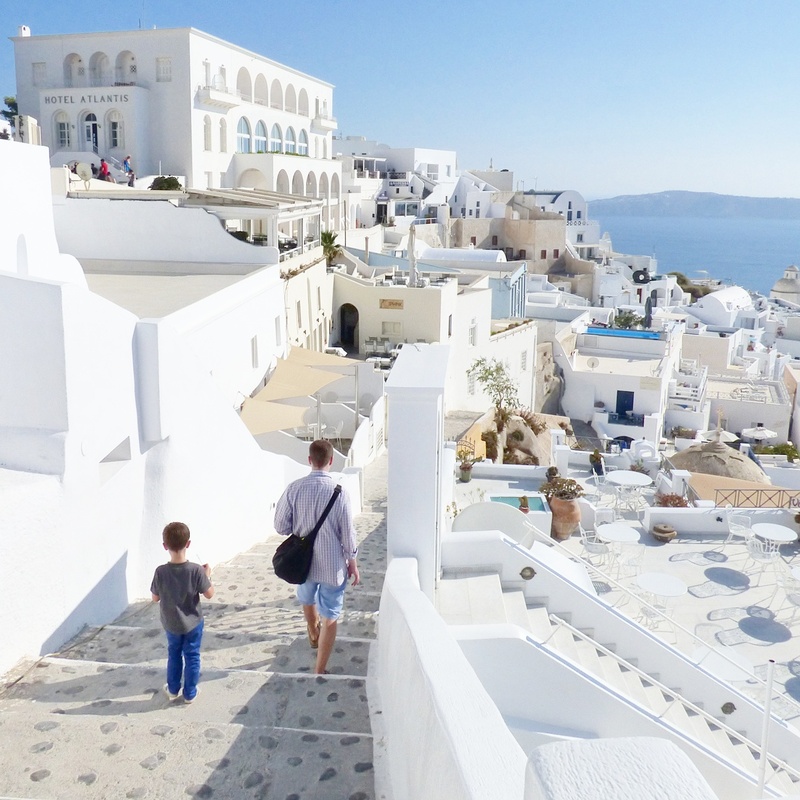 While Oia may be the prettiest village in Santorini, Fira is the island's main town with the island's handiest service, best museum, and the hub for transportation around the islands. But, just because it's functional doesn't mean it's not incredibly scenic! 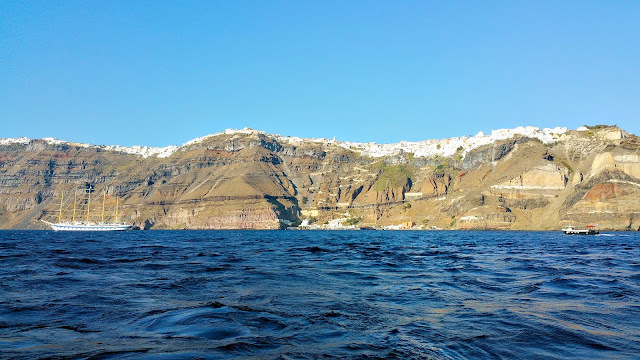 After seeing Oia, Chris and I went back to the boat to pick up our little ones to explore Fira all together. We hopped on another tender and made the short trip to shore. From the Old Port there are three ways to get up to town: take a cable car, hike up 587 steep steps, or ride a donkey up those steps. We went with the speed and comfort of the cable car. 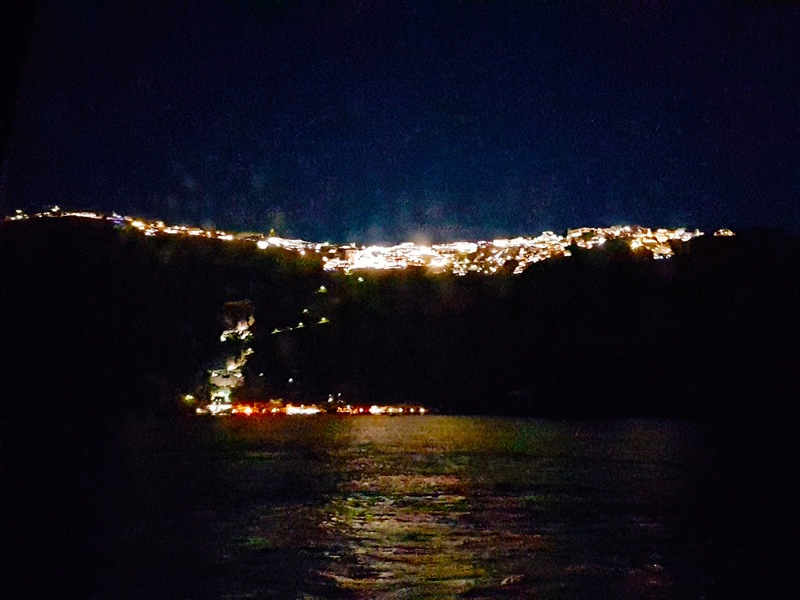 Fira has a charm all its own with a cozy labyrinth of streets that burrow between the main traffic street and the cliff edge. Cafe. A restaurant sign harkening to the belief that this area may have inspired the legend of Atlantis. Yummies. We got some baclava in Mykonos that was pretty darn good. 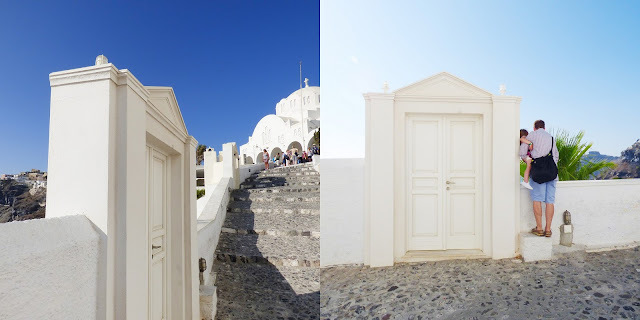 Fira has a pair of cathedrals, Orthodox and Catholic. This is the Orthodox one. I spy the big big boat. 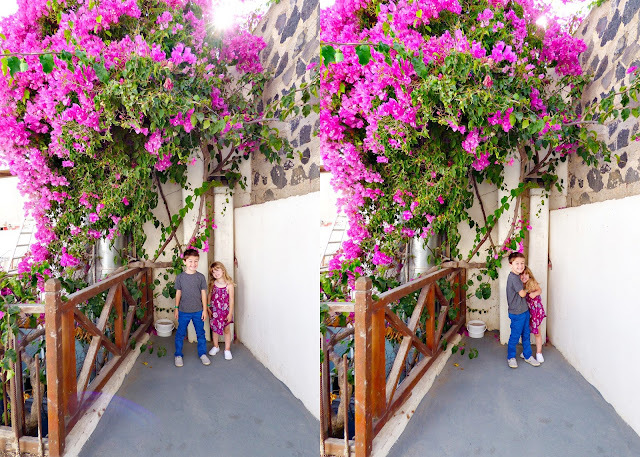 One of my favorite photos from the day: My guys wandering through the dreamy and scenic streets of Santorini. If street names exist in these villages, locals completely ignore them. Fox has forgotten he's an LA baby and has grown accustomed to the cooler Bavarian weather. But, he was good to go again after a little break in the shade. Pretty portico near the Orthodox cathedral. Doors with no walls around them! | Peeping Chris. Little Jane doggedly refused to ride in the stroller after Chris crashed the stroller with them in it in Edinburgh. She insisted on walking so for several of our adventures we left the stroller behind on the boat. It was nice. This area is still an active volcanic site. Two little islets in the middle of the caldera have emerged "recently" (at least in geological terms), one as recently as 1707. The last small true eruption occurred in 1950 and there were photos of this on a wall. They were fascinating to look at. To this day, those two new islets go through periods where they sputter and steam and earthquakes continue to wrack the archipelago. No wonder Santorini is sometimes called "The Devil's Isle." But, to us it was heaven. Chris watched the sunset from the top of the boat. Our boat stayed in port until 10pm so we got to admire the lights of Fira lining the cliff from our stateroom. Our family in Fira, Santorini, Greece on Monday August 29th 2016. 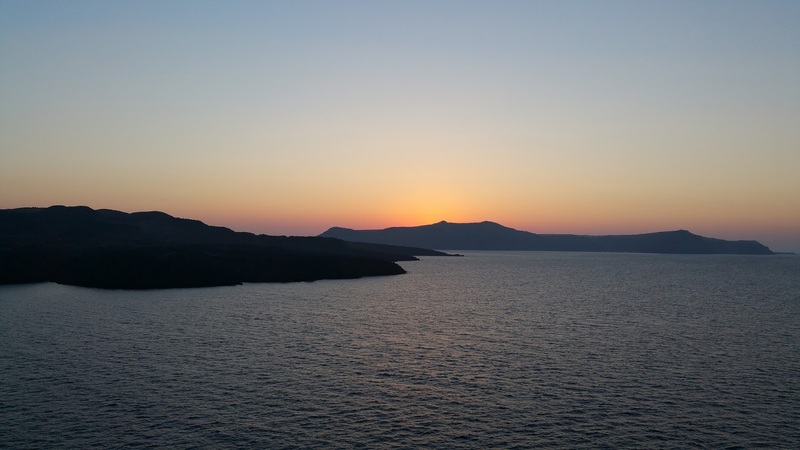 Then onto a quick stop in Crete! Beautiful place! LOVING the photos!! That cat you captured is gorgeous!!!!!!! !